When last we left our pals from Pine Ridge they were involved in considerable intrigue. They were receiving reports from the Masked Muskrat, threats from the Black Pelican, and a baby from a melancholy mother. 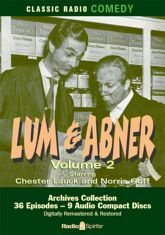 The further adventures of Lum Edwards and Abner Peabody find them confounded by one commotion after another. At the Jot 'em Down Store, there is much bother about the baby, a mystery about a coat-of-arms, and mischief about ghosts, gunshots and gold mines. Once again, these 36 digitally restored and remastered episodes, starring Chester Lauck and Norris Goff, are available from the Radio Spirits Archives Collection - featuring re-releases on CD of some of our most popular long-discontinued cassette collections.